It’s ‘March Indecision’ time. Should I fill out a bracket this year? Will I be able to resist watching the end of nearly every game because I happened to have filled out a bracket (probably not)? Who should I pick to play Kentucky in the final? These are difficult questions for someone who watched less college basketball this year than in any of the last 35. Putting this vexing decision aside, I resolved to make my own, much smaller tournament. Welcome to the very unofficial CLS ex-U.S. regional championship. Asia ex-Japan: Primarily invested in Asia’s emerging markets as well as Hong Kong and Singapore, this region offers the most rapid economic growth, reasonably attractive valuations, and the highest allocation to technology stocks outside the U.S.
Europe: Among the developed economies of Europe, expectations for these struggling markets are low. Paradoxically, the low expectations create an environment where any improvements are likely to be rewarded. Recent quantitative easing by the European Central Bank has pushed currencies down and made the economies of Europe more attractive. Business and economic reform offer hope of improved profitability. Europe seems to be improving. Japan: Corporate Japan is led by a mix of consumer discretionary companies participating in the automotive and electronics markets. While Japanese Prime Minister Shinzo Abe’s third arrow of structural reform looks to be stuck in the bow, corporations are becoming more shareholder-friendly. Returns on equity are rising. Even if revenue growth is slow, profits can rise. Latin America: This is the best performer in the group over the last 10 years, but the worst over the last five. Formerly a great growth story, Latin America has been buffeted by slowing Chinese demand for its raw materials and left-leaning governments not friendly to investors. Europe wins as long as oil and commodity prices don’t skyrocket. European economic growth appears to be picking up, and the weak currency improves competitiveness. Brazil, the largest market in Latin America, recently raised rates to counteract inflation, and economic growth in the “emerging markets” of Latin America is slowing to below the U.S. growth rate. That’s never a good sign for an emerging market. Europe moves into the finals. This contest is a tough one. Asia ex-Japan’s growth story shines compared to Japan’s anemic growth, but Japan’s market appears cheaper. The sector mix, however, favors Asia, and technology innovation will lead to higher capital expenditures. I’ll choose Asia ex-Japan, but this one could be very close. In the finals, I’ll pick Asia ex-Japan over Europe by a thin margin. The southern part of Europe is very cheap, but England and Germany aren’t as attractive. In a low-moderate growth world, Asian businesses have access to growing domestic markets and globally competitive workforces. Chinese shares may benefit from slowing growth as brands will develop, and reforms in India expand the growth profile in Asia. 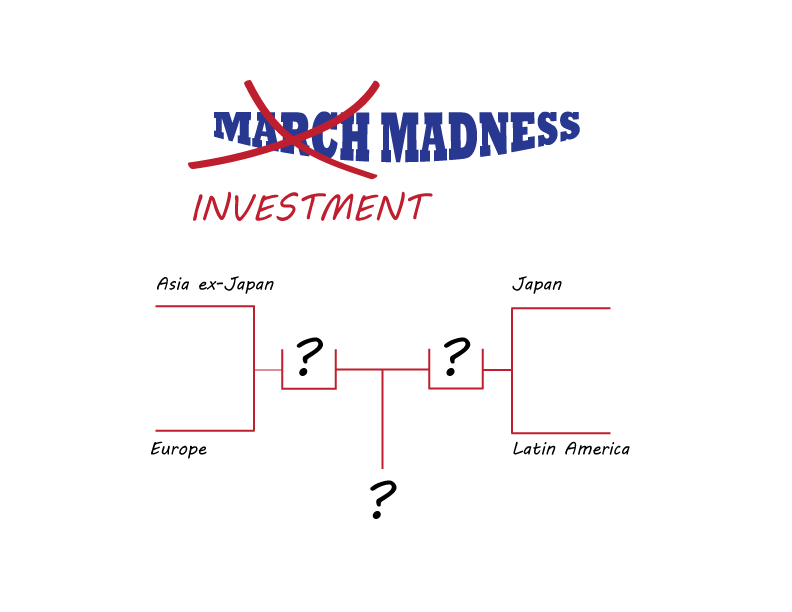 The best news for investors in this four-team tournament is there were a lot of good choices. Three regions offer better investment opportunities than the U.S. — another reason I’m glad CLS is emphasizing international.